A shot of a logic board claimed to be from Apple's next-generation iPhone shows a design largely the same as the iPhone 5, though the screw hole has been placed in a new location. Purported "iPhone 5S" board on the left, via Moumantai. 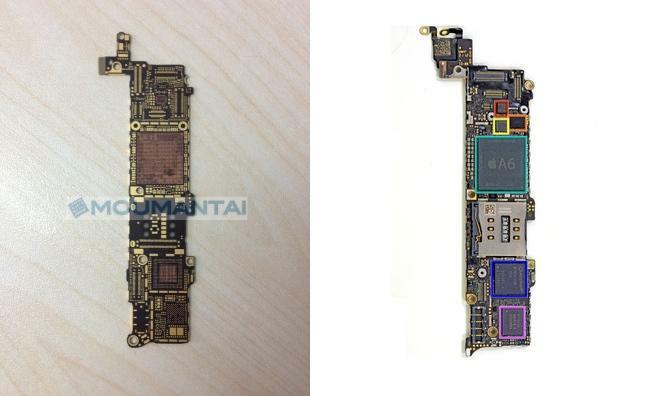 Actual iPhone 5 board on the right, iFixit. The board, which was first noted by Macotakara, also lacks a processor, but the space for the CPU appears to be about the same size as on the current iPhone 5 logic board. Aside from a slightly different screw placement atop the board, the part looks largely identical to its predecessor. If legitimate, the part could hint that Apple's next iPhone will sport largely the same design as the iPhone 5. That would be in line with rumors, which have dubbed the handset as the "iPhone 5S," suggesting that any hardware upgrades would not alter the design of the device. As for the absent processor, rumors from earlier this year claimed that Apple won't debut a full-fledged next-generation "A7" chip until 2014. That processor is rumored to be built by Taiwan Semiconductor Manufacturing Co. in a 28-nanometer process. An identically sized space for a processor could signal that the next iPhone will retain the 32-nanometer process utilized to build the current A6 and A6X chips found in the iPhone 5 and fourth-generation iPad, respectively. Apple switched from a 45-nanometer process to 32 nanometers in 2012 with the debut of the A5 CPU. Parts claimed to be from Apple's next iPhone have increasingly appeared in recent weeks, suggesting that production of the device could begin soon. Other recently leaked parts include a FaceTime camera, home button, vibration motor, SIM tray, volume rocker, and mute switch.